Professor David Fetterman, director of the Policy Analysis and Evaluation Program at Stanford's School of Education, knew something was up when all 21 of his graduate students crowded into his office and said they needed to talk to him. Fetterman said he expected last-minute questions about papers or exams. Instead, his students told him they had raised $10,000 in his name for the computer lab at the Belle Haven Elementary School in east Menlo Park. 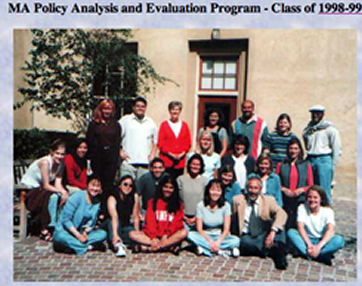 Without Fetterman's knowledge, the 1999 graduating class at Stanford School of Education's Policy Analysis and Evaluation Program raised the funds by contacting local foundations and individuals, putting their classroom training to actual use. On June 11, the students brought Belle Haven Principal Douglas Harrell to Fetterman's campus office to make the surprise announcement. Fetterman said he was speechless, and Harrell was in tears. "I was completely overwhelmed," said Fetterman. Part of the graduate program is to study public policy and evaluate how it can be improved, and the students told Fetterman the inspiration for the fundraiser came from his lectures about wealthier schools that have access to computers and poorer schools that do not. Belle Haven's second-grade class made several walls of artwork that will go on display at the School of Education. And Fetterman's name will be inscribed on each of the school's new computers, another tribute from his students. The MA Policy Analysis and Evaluation Program is designed to provide graduate students with experience and pubulic service opportunities in the community, said Fetterman, the program's director.